Intersection of U.S. 341, 23, 441, 319 and 280. All roads lead to liberty. The Telfair County War Memorial in McRae sports a miniature Statue of Liberty, as well as a listing of the sons and daughters of the county who lost their lives defending our nation. Nicely done, Telfair County! The Liberty in McRae is one-of-a-kind and built locally, which adds to her charm. At the corner of the main intersection in McRae is a small copy of the Statue of Liberty. Next to it is a copy of the Liberty Bell. McRae, Georgia: Land of Liberties. Both the Liberty and the Bell were made by local townspeople out of recycled materials. The Statue of Liberty has been removed from its pedestal in Liberty Square. Only the bell (Liberty Bell wannabe?) and the pedestal that Liberty once stood on remain. With the pedestal still there, it sounds as if a repair/restoration of the statue is underway....? 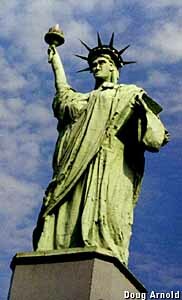 Another view of the Statue of Liberty in McRae, GA. Believe me, the statue is truly hideous, but the town seems to have proudly stationed it right next to the City Hall in downtown McRae. A tribute to the attitudes found in small southern towns! Scrap Metal Creations, Helena, GA - 4 mi. Site of World's First Stuckey's, Eastman, GA - 18 mi. Vidalia Onion Museum, Vidalia, GA - 32 mi. Museum of Aviation, Warner Robins, GA - 54 mi.